Last night, our fair heroine (AKA me) was innocently sitting on the sofa minding her own business when email dinged. A quick check revealed that The Boss Man (role being played by Ryan Miller of Growth Stimulus Training) was taunting me with visions of Korean Steak Tacos. Not only did he just describe them but he actually sent a link to the recipe for them. I love Korean food from bibimbap to char siu to bulgogi beef soup. Not to be outdone. I whipped up my own version of Korean tacos for lunch and I did them Quest Style. They turned out delish and I have plenty leftover to make a taco bowl later for another variation of it. To make the marinade, combine the cilantro, brown sugar, soy sauce, sesame oil, vinegar, garlic, coriander, and red pepper in a small bowl. Whisk to combine. Cut your protein into small, bite sized pieces and add to the marinade. Toss slightly to coat the protein pieces. Marinate in the refrigerator for about 30 minutes or overnight. Turn every now and then to marinate all sides. Preheat your grill or the broiler on your oven. Remove the protein from the marinade and grill or broil until cooked thoroughly. Remove from heat. Warm the corn tortillas and fill with the protein. Top with kale, carrots, green onions, and jalapeno rounds as desired and garnish with additional cilantro. 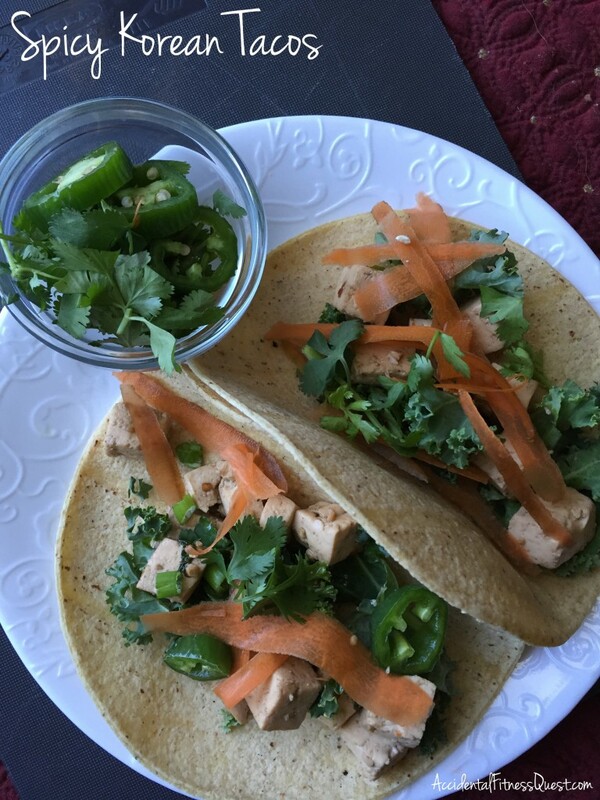 Makes 4 servings of 2 tacos each at approximately 260 calories per serving for the tofu version – 14g protein, 33g carbs, and 8g fat. You can chop the carrots if you don’t feel like being fancy. I simply used a vegetable peeler and peeled the carrot into ribbons. You can also break out your spiralizer if you have one of those. Don’t feel like tacos? Make Korean nachos, throw everything in a bowl, or make them into a wrap. There are plenty of ways to fill or not fill a tortilla. If you’re interested in working with me to get meals together fast while working towards your health goals, I’d love to chat. Drop me an email, or come on over to Facebook and ask a question. I’d love to hear about your favorite food.